Should you eat before you train? It’s totally up to you! Some people feel better training in a fasted state, while others feel light-headed and sluggish without a little something in their stomachs. Generally, I tell clients; unless they’re working out early in the morning, doing a low-intensity work-out or practicing intermittent fasting in an informed way (see my previous blog on IF), having at least a small meal before a workout is a good idea. Especially when trying a new workout, or training at a high-intensity. If you do decide to eat before your workout, you want something that: 1. Is nutrient dense, with simple carbs (fruit) to give you the energy to kickstart you sweat session. 2. Contains complex carbs (oatmeal, brown rice, sweet potato, or whole grain bread) to sustain you through your workout. 3. Has protein. The exact macros all depend on how much you can stomach while training, and your daily caloric needs. If your goal is weight-loss; a general rule is to keep it light like the recipes below. Also, try eating 1 hour before you work-out, so it doesn’t weigh you down or upset your stomach. Beets have been proven to improve performance in workouts. With just ½ a scoop of protein powder, this recipe provides an appropriate amount of protein before a workout. 1. 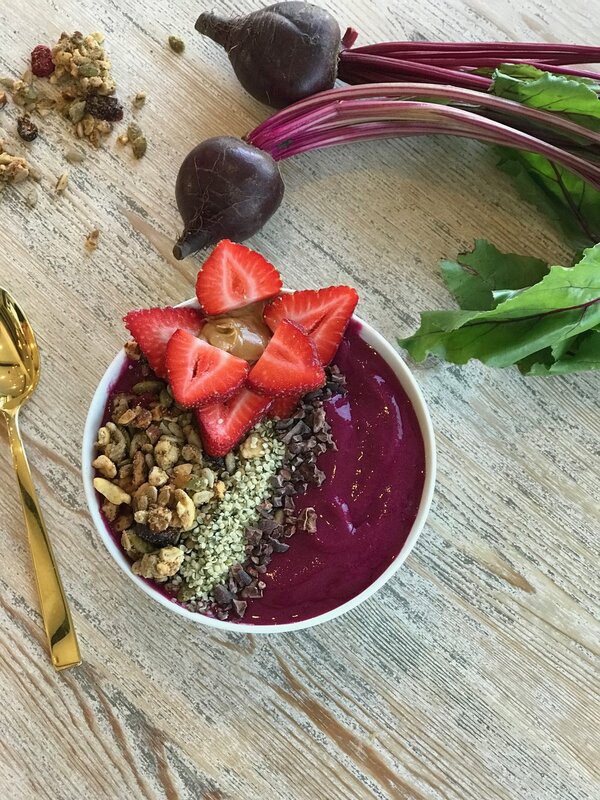 In your blender or food processor, combine the beet, raspberries, banana, milk and protein powder. Blend until smooth and thick. Start on low and gradually increase speed until fully combined. A quick and easy recipe that can be meal prepped in batches and taken on the go. Combine all ingredients in a container with a lid. ("Ball" Mason Jars are great, but any sealed container works) Cover and store in the fridge overnight. Add an extra splash of almond milk or a drizzle of maple syrup to sweeten more if desired. For More Protein: Add an extra spoonful of nut butter. You can store in the fridge for up to 4 days. or until ready to eat. Sweet Potatoes provide healthy complex carbs that will sustain you through your workout plus a ton of antioxidants that will help with recovery, too. 1. Cut pointy ends off sweet potato. Slice lengthwise into 1/4-inch slices. Use two slices. 2. Pop the sweet potato slices into the toaster and toast on high twice. You may need to toast a third time depending on your toaster. 3. 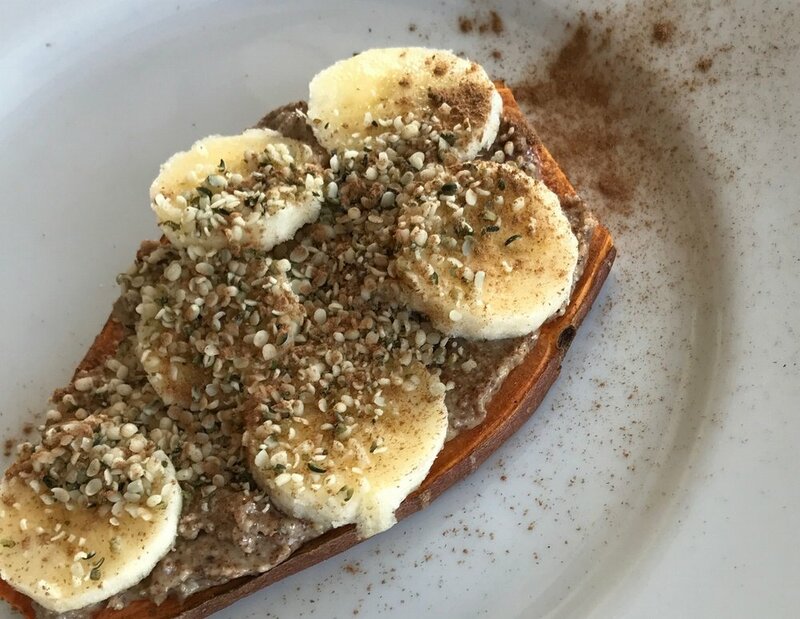 Place toasted sweet potato on a plate and spread with peanut butter then top with sliced banana, hemp seeds, and cinnamon. Optional: drizzle lightly with maple syrup to sweeten. Chances are you’re pretty hungry after your workout. But your post-training meal is not just about satisfying hunger. This is a crucial time for maximizing both the benefits you will see from training and how well your body recovers for the next work-out. Ideally, you want to aim for a meal that is high in protein and has a good amount of complex carbs. The amino acids in protein provide the building blocks for new muscle, while the carbs replenish your glycogen stores. You should be looking to consume 15-25 grams of protein, ideally 30 minutes after exercise. Despite the popular misconception that “more is better” when it comes to protein, research shows consuming more than 15-25 grams in your post workout window has no additional benefit to muscle building. 25 grams is the maximum amount of protein needed in one meal to stimulate protein synthesis. You need what you need, but more is definitely not better. Any extra protein in your meal means extra calories that will be stored as fat or used as fuel. The easiest option for ensuring you get enough protein after your work out is by using a clean, organic (preferably plant-based) protein powder 30 minutes - 1 hour after you finish training. This is the best option if you are commuting home or cannot make a meal within the ideal refuel window. 1. Prepare quinoa according to the package. Season with a squeeze of lemon, salt, and pepper. 2. Heat up beans in a separate pot. 3. chop tofu into cubes, heat up in frying pan if desired. 4. Top with salsa and avocado. 2. Spread Hummus on toast, then top with mashed Avocado. 4. Top with Pumpkin Seeds.